Only a professional plumber in Laguna Beach, CA can fully satisfy your need for expert plumbing solutions. Rest assured that when we come over, we already have with us all the necessary tools and spare parts so we will not have to rush back and forth for anything else. It takes years for a plumber to get his or her license, and that type of experience and skill shouldn’t be taken lightly. Call us for plumbing repair or to perform general cleaning, and expect our Laguna Beach plumber to be right over in one hour. The last thing we want to do is to go into your home and start destroying walls to get to the pipes. Right here in OC Plumbing Pros, you can find plumbers who work with your best interest in mind. Call us the very first moment you suspect that something is wrong with the pipes. Call us 24/7 at (949) 371-8413. Foolproof Water Heater Installation and Repairs: When your water heater is damaged, you immediately think about buying a new one but it’s recommended that you let us look at your damaged water heater first before you make a decision. Yes, you will spend money but it will likely not cost the same amount that is in your mind right now. Sometimes, all it takes is just a simple repair job. You might even save more money this way. Drain Cleaning Services To Unblock Clogs: Cleaning drains is a task that is often left out, only to regret it later when the water is pooling in your kitchen sink. If all the drain-cleaning agents in the market no longer work, we have the perfect equipment to do the job. But we are here to deal with things like this, using our high-tech gadgets and our expertise to safely and completely unblock the clogs from your drains. More savings for you, of course. Detecting and Repairing Hard-to-Find leaks: If you cannot locate the leak yourself in your Laguna Beach property, especially in the case of slab leaks, which are difficult to spot without the proper tools, have our qualified team over to check it out and repair it. If we can save you a lot of money, then we go home happy. Then you really have a problem on your hands. Don’t wait for the problem to worsen, call us now and our modern detection tools will be able to pinpoint the leak even without breaking your walls or floors first. Emergency Plumber Laguna Beach – Call Us Now! 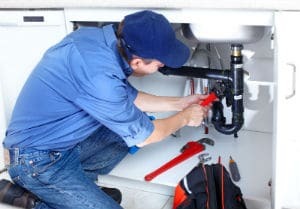 We Provide Re-piping, Garbage Disposal Repair and Installation Services: Building code requirements in Laguna Beach mandate that you hire licensed professional plumbers to lay down the pipes in your house or office. Never, ever try to do this on your own. It’s a complex system of gravity, water pressure and flow. Our licensed plumber can also fix your leaking garbage disposal, or set up a new unit in your home. Look no further than our company, then, and receive expert advice on the best thing to do when your unit is in trouble. Let us emphasize that repairing or installing garbage disposal is something you must leave under the hands of an expert, because there are specialized tools and skills needed to get the job done flawlessly. Worry Not About Toilet Installations and Repairs: Have peace of mind that our team will address your situation right away. We at OC Plumbing Pros always strive to be as less intrusive as possible. Call us and we will have our plumbers assess the situation, and if we find your toilet broken, we will advise you to get a new unit, instead. A damaged seal in your toilet is not just gross, but actually a health issue. 24/7 Emergency Services Available At OC Plumbing Pros: We understand that plumbing emergencies can happen when you least expect them, the reason why we make ourselves available 24 hours a day. We can then send a team of technicians to your location as soon as possible. Nobody can predict the future, and so you can’t really determine when your plumbing system or toilet breaks down. Every call is processed right away although the estimated arrival time will depend on traffic and distance, of course. Connect With Our Laguna Beach Plumbers Today! Please understand however that while we can give you a price quotation, the estimate may change depending on the results of the ocular inspection. We require excellence in all our undertakings, including our customer service. Our plumbers go the extra mile in providing helpful advice regarding routine plumbing maintenance to ensure your system is at its most efficient state. In this case, we can rightly claim that OC Plumbing Pros is synonymous to quality and competitive pricing. Call our plumbing contractors today at (949) 371-8413!